Growing hazelnuts from a seed is quite easily done, unless you live in a climate where it is freezing all the time. The key to good hazel tree growth is choosing a variety of the species that will grow well in your climate. European hazels, for example, are susceptible to blight in eastern North American climes, so if you are growing there, you might want to choose an American hazel species instead. No matter where you plant them, hazelnut seeds (which are actually nuts, and are also called filberts) should be planted in autumn. Start them in containers outdoors. 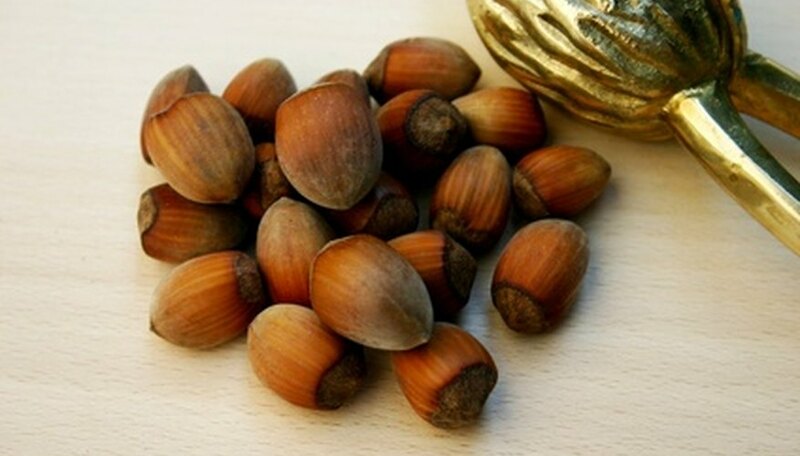 Place hazelnuts in a small container and fill it with water. Wait a few minutes to see which ones sink and which ones float. Discard any that float, or dry them off, shell and eat them. Nuts that float will not grow well, if at all. Mix together two parts compost and one part sand, to ensure that the compost has good drainage. Place this in planting containers. You do not need soil at this point, because this is a starter mix, and you are trying to baby your hazelnuts. Plant a few hazelnuts in each container, about 2 inches apart, at a depth of approximately one and a half times the length of each nut. Place small-gauge chicken wire over the tops of the buried hazelnuts, just underneath the surface of the soil. This will deter squirrels, birds and other pests who might otherwise eat your hazelnuts before they have the chance to grow. Water the hazelnuts occasionally, when the weather is above freezing. Thin the seedlings as they grow, until just one strong one remains in each container. You can transplant the others or discard them. Transplant the seedlings when they reach a height between 20 and 40 centimeters. Dig a hole that is approximately one and a half times the depth of the root ball. Add compost, then gently remove the seedling and its root ball from the container and transfer it to the ground. Cover the root ball with soil and mulch. Mulch will help the tree retain moisture, keep the temperature of the soil more constant and help deter weeds. Harvest your hazelnuts in 3 to 5 years. Hazel trees need time to establish themselves before they will produce nuts. Squirrels like to steal and hide the nuts, but you can trick them by leaving some cylindrical containers (such as pipes) around. Squirrels will often hide the nuts in these containers. You can then thank the squirrels for doing the hard work of harvesting for you.